Mumbai, April 11: After 108 economists and former RBI Governor Raghuram Rajan, International Monetary Fund's (IMF) Chief Economist Gita Gopinath has expressed doubt over India's growth rate, saying that there are still some issues with the way India calculates it. This comes as a blow for the government as the key argument that senior officials in the NDA government have consistently made is that the GDP figures are accepted by global organisations like the World Bank and the IMF. 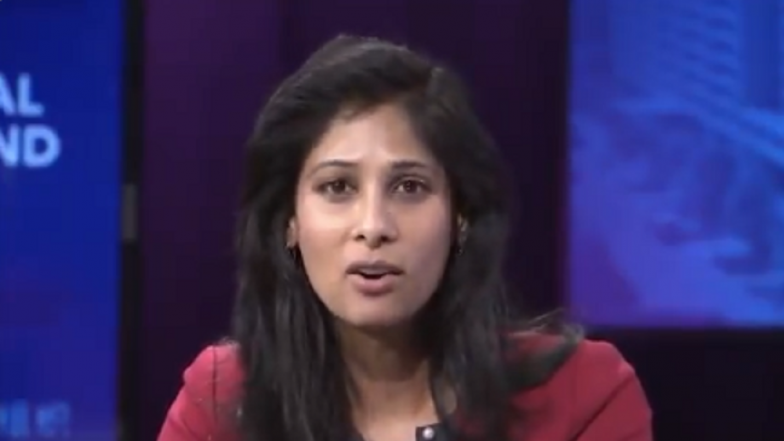 IMF's Gita Gopinath Says India Must ‘Transparently Communicate’ Its Growth Numbers. "With regards to the newer numbers that are coming out, we are paying close attention to it, we are speaking closely to our colleagues in India and then we will make a determination based on that," Gopinath told CNBC. While she welcomed the changes made to the GDP calculation in 2015, including the change in base year, she also flagged concerns over the "deflator" used to calculate the real GDP. Several experts have expressed doubt over the unemployment, growth rate figures and have alleged that the government was suppressing uncomfortable data. Gita Gopinath Becomes First Female Chief Economist to Join International Monetary Fund.